The injury list is growing. Their postseason hopes are in serious jeopardy. They’ll need breaks to go their way with teams ahead of them in the wild-card chase. “I think there is a lot of, on the outside, a lot of fingers pointing a lot of different directions,” the veteran left tackle said on Wednesday. “And if you were to ask me what we need to do I think we need to take that finger and we need to point it at ourselves. While it may not be a long list, some of the same problems keep nagging the Packers: they’re having problems on third downs and they’re having trouble closing out tight games on the road. Fortunately for Green Bay (4-6-1), the last month of the season has a favorable schedule starting with a home game this weekend against the Arizona Cardinals (2-9). It’s the same team that allowed Philip Rivers to go 28 of 29 for 259 yards with three touchdowns in a 45-10 loss to the Chargers. “He’s one of my favorite players to watch,” said Rodgers. He watched last week’s film and praised Rivers for, among other things, throwing into tight spots and finding the right receivers. As for Rodgers, he’s apparently taking some heat from TV pundits for at least a couple of poor throws in last week’s 24-17 loss to the Minnesota Vikings. The two-time NFL MVP fielded a couple of questions about fundamentals after practice Wednesday. One attempt might stand out — a throw to receiver Equanimeous St. Brown on second-and-1 at the 20 with 2:34 left that bounced near the rookie’s feet. The Packers settled for a field goal, and the Vikings ran out the clock. Another misfired throw stuck to the quarterback’s hand, Rodgers said. “Oh, it’s embarrassing, for sure. … I remember (Hall of Fame quarterback Brett) Favre used to say, ‘Anything you do, I’ve done many times previous.’ And I actually tell the young guys this all the time, ‘The mistakes you make, I’ve made before,'” Rodgers said. But when it comes to fundamentals, Rodgers said nothing has changed, other than his completion rate of 61.7 percent is down from the past couple of seasons and below his career average of 64.9. He still drills them. He said he’s not playing any differently. The Packers’ offense has been so prolific for so long under Rodgers and coach Mike McCarthy that season-long problems such as they ones the offense has had tend to stand out. “We had some opportunities that we hit sometimes and sometimes you don’t. The most important thing for us is to keep going after it. And that’s what we’re doing,” McCarthy said. Consider that Rodgers has thrown 20 touchdowns to just one interception, a ratio that almost any other team in the league would crave. He finished the second drive against Minnesota with a vintage back-shoulder touchdown throw to No. 1 wideout Davante Adams. The quarterback was hamstrung earlier in the year by a left knee injury that limited his practice time. Starting receivers Randall Cobb and Geronimo Allison have been hurt for much of the season, and tight end Jimmy Graham is now trying to play through a thumb injury. It has left more attention from opposing defenses to Adams, and more snaps for rookies St. Brown and Marquez Valdes-Scantling. 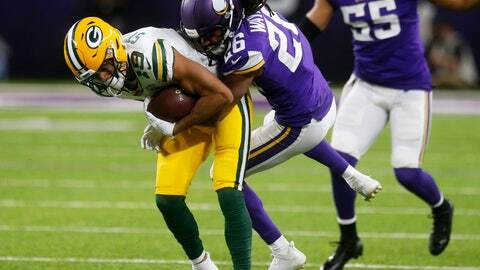 The Packers were 2 of 10 on third down against the Vikings, including 1 of 6 in the second half, when they were held to just three points after being tied at 14 at halftime. Green Bay also couldn’t convert on fourth-and-1 from its 44 in the third quarter. “I think we’ve just got to be more decisive as a unit,” Bakhtiari said. His availability is in question for Sunday after he missed practice with a knee injury. Starting left guard Lane Taylor (quad), along with Cobb (hamstring) and cornerback Kevin King (hamstring) were limited.